Frequency inverter provides dramatic energy savings by optimising the system, not by improving the actual efficiency of the motor in isolation (as an energy efficient motor retrofit would). 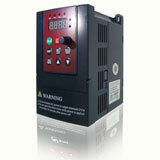 In fact, a Frequency inverter system is about 4% to 6% less efficient at full load than an induction motor alone. 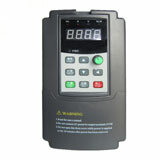 This is mainly due to the losses in the Frequency inverter itself. However, it doesn't take much operation at reduced load to save more energy than is lost at full load. Average loading as high as 90% can justify a Frequency inverter retrofit for high-duty applications. Most induction motors can operate with modern Frequency inverters through moderate speed ranges (around 30% to 100% speed). Sustained operation at low speeds and, in particular, high load at low speeds may require a special or larger drive and special measures to cool the motor. AC induction motors operate hotter with a Frequency inverter because of harmonics, impurities in the electric power they provide to the motor and also the slower rotating speed of the motor's integral cooling fans. This is usually not a problem if speeds are continuously above 40% or where there are brief periods of slow-speed operation. However, prolonged operation at or below about 30% speed, especially when driving significant loads, can cause rapid and potentially damaging heat in some motors. In Frequency inverter/motor systems, starting torque is typically determined by the drive (not the motor). For conventional Frequency inverter applications, the Frequency inverter/motor system will have a peak starting torque of about 130% of rated full-load torque, which is significantly less than what the motor could develop by itself. This level of starting torque is acceptable for most variable speed loads, but some loads (especially constant-torque loads such as conveyers, escalators, augers, or reciprocating compressors) may require greater starting torque. Although they can improve displacement power factor (DPF), modern Frequency inverters also create harmonics, which reduce real power factor. (Real power factor includes harmonics and DPF.) For instance, while a Frequency inverter can improve DPF to close to 1.0, the harmonics generated by the Frequency inverter can cause the real power factor to decline to between 0.75 and 0.80. These harmonic currents (most often the fifth and seventh harmonics) tend to exacerbate resistance losses and can even negate the benefits of improved DPF. To minimise this problem, more and more Frequency inverter manufacturers are packaging harmonics-mitigating equipment (such as line reactors or isolation transformers) with drives. This lets users enjoy the full benefits of power factor improvement. What’s more, this added equipment can significantly reduce the impact of Frequency inverter-generated harmonics on other electronic equipment. Pulse-width modulated drives can cause significant damage to motors if the length of cable between the Frequency inverter and the motor exceeds 15 to 30 metres. (The number seems to differ by manufacturer.) Using pulse-width modulated Frequency inverters on older motors with long cable runs may shorten the life of the motor. It is important to determine any mechanical resonance frequencies and to program the Frequency inverter to avoid steady operation at those speeds. These resonance frequencies, common in large fans, gears, and belt-driven systems, can cause significant damage through vibration. To ensure that your frequency inverter and motor are compatible, either buy them from the same company, or ask the inverter manufacturer to test the frequency inverter to make sure it's compatible with another company's line of motors.